It was almost as if EA had totally given up on Harry Potter license towards the end – Harry Potter and the Deathly Hallows: Part One was close to being an absolute abomination. Thankfully for Harry Potter fans the license is back in the hands of Warner Bros. As we’ve mentioned before, Warner Bros. appears to genuinely care about the quality of games they release. 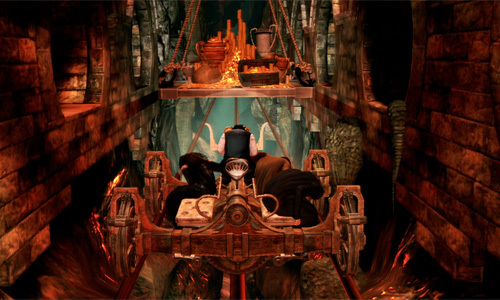 The Harry Potter for Kinect demo, available now for gold members, offers three mini-games. There’s the chance to catch the golden snitch during a match of Quidditch, a journey to the Lestrange Vault at Gringotts Bank via a glorified mine-cart and a mission to destroy Hogwarts’ bridge while fleeing from Death Eaters. 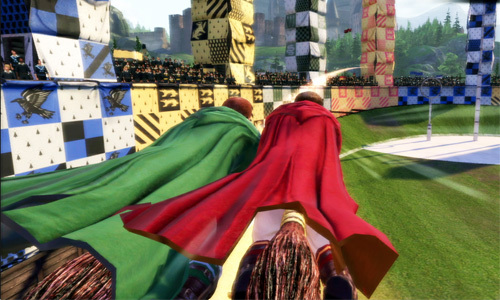 Quidditch reminded us of EA’s Road Rash, of all things. Harry can kick and punch the opposition, who attack from both sides. Catching the snitch requires you to following a glowing path before eventually reaching out to grab it. We managed to ‘five star’ this mini-game while sitting down on our first play, just to illustrate how little effort is involved. The differences between the other two mini-games aren’t particularly vast. They’re on-rails (quite literally in the case of the trip into the Lestrange Vault) and you’re simply required you to lean left and right and jump and duck at the right time. Both mini-games give you five lives; fail and it’s ‘game over’. Eurocom have worked on the Harry Potter license before, having developed The Chamber of Secrets back in 2002. A long time ago that may be, but this demo still suggests that no disrespect seems to have occurred to the source material. When we first caught glance of Harry though he did appear to be a bit on the robotic-side, almost resembling the child from Steven Spielberg’s A.I. Even though the last Harry Potter film was way over a year ago, this is a game that is likely to sell well over the winter period. The demo doesn’t give the chance to try the co-op mode or interact with other characters – as the press release informs us will be possible – but what we’ve played so far has been a bit on the simple side. If two of the three mini-games here both play almost identically, then how much variation is the full game going to offer? Then again, it’s always the simple Kinect games that work the best. One of the guys on my dev team at kwalee worked on this. (Not very) Fun fact!